The California Sportfishing Protection Alliance (CSPA) joined Friends of the River (FOR) and three other environmental organizations in submitting a clarification and public process request to the Federal Energy Regulatory Commission (FERC) on April 19 regarding repairs of the damaged spillway facilities at Oroville Reservoir. The massive erosion of the main spillway at Oroville Dam, followed by the evacuation of over 188,000 people in Butte, Yuba and Sutter counties after state and federal officials feared a failure of the auxiliary spillway, has focused state, national and international media attention on the California Department of Water Resources and its federal partners. The letter asks FERC to release as much information to the public about damage, plans and repairs as is “reasonably possible,” according to Chris Shutes of CSPA. (calsport.org/..). It also asks FERC and DWR to “allow discussion of this information in a public process that allows meaningful public input and response to the design and repair of dam’s facilities.” In addition, the letter asks FERC to clarify the process by which parties to the relicensing of the dam can engage in the reconstruction process. The three other organizations signing the letter are the South Yuba River Citizens League, Sierra Club, and American Whitewater. Shutes noted that the letter in particular advocates for construction of a complete second (“auxiliary”) spillway at the dam, in addition to reconstruction of the main spillway that failed in early February. A recent Associated Press examination of state and federal documents, emails obtained under public records requests and numerous interviews reveal “a sequence of questionable decisions and missteps, some of them made years ago, some of them in the middle of the crisis” at Oroville Dam. “Among other things, the dam's federal and state overseers overestimated the durability of the two spillways. And in public statements during the emergency, they failed to acknowledge — or perhaps recognize — that while they were busy dealing with one crisis, they were creating a possible new one," the AP investigative piece by Ellen Knickmeyer and Michael R. Blood stated. On April 20, DWR announced it will be hosting seven public meetings in multiple locations to update communities in the region about the ongoing Oroville spillway recovery effort. 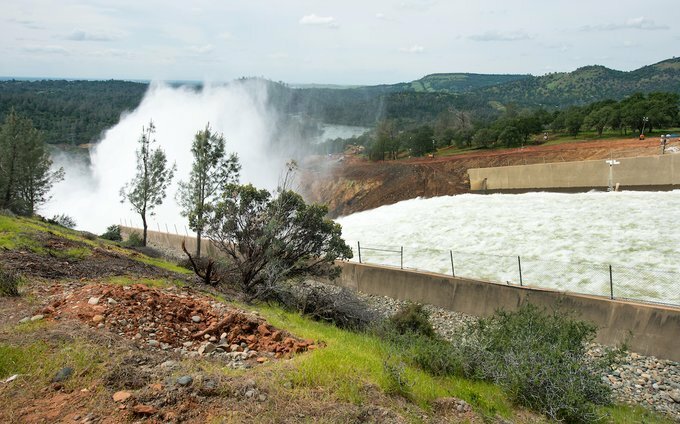 “The meetings will be opportunities for members of the public to hear from DWR leadership and experts about the status of the Oroville spillway and to ask questions and provide comments about the recovery process. The meetings will have a similar agenda, format and content,” according to DWR.